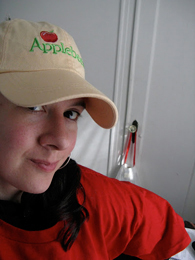 Tracie McMillan worked at a peach orchard outside of Kingsburg, California, in 2009. Women often cover their mouths with bandanas to avoid inhaling dust. For reasons McMillan doesn't understand, men don't. Press Coverage of "The American Way of Eating"
McMillan's room when she picked garlic near Greenfield, California. 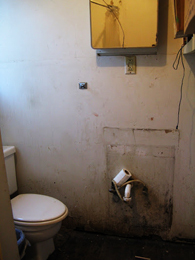 The bathroom in the house where McMillan lived when she picked peaches in Kingsburg, California. 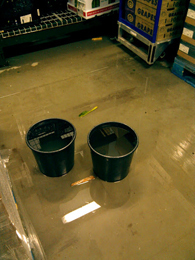 Buckets overflowed from an unfixed leaky ceiling in a back room at a Walmart outside of Detroit, Michigan. 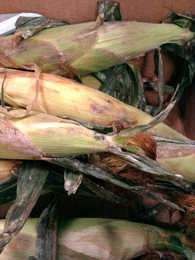 Walmart's moldy corn is stripped, then donated to a local food bank in a store outside Detroit, Michigan. McMillan dressed for work to "expedite" meals at an Applebee's in Brooklyn, N.Y.
Why is it so difficult for many Americans to eat well? What would it take for all Americans to do so? 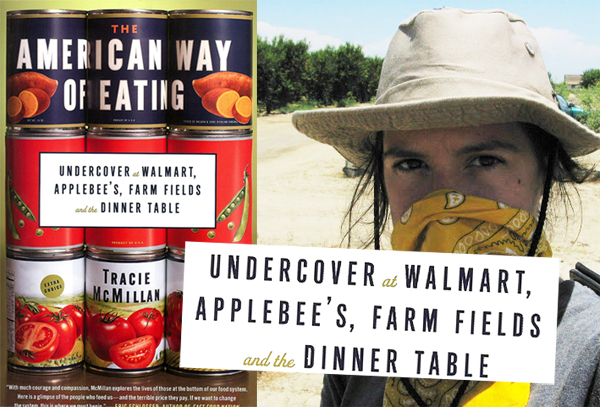 In "The American Way of Eating: Undercover at Walmart, Applebee's, Farm Fields and the Dinner Table," (Scribner, February 21, 2012) Tracie McMillan portrays the life she led for 18 months when she confronted the daily challenges common to those who live off the meager wages earned in low-level food industry jobs. Evocative scenes take readers from the pain-inducing work in farm fields, supermarkets, and restaurants to the crowded, chaotic homes and dinner tables she shared with fellow workers. McMillan weaves her own journey into the broader context of a broken food system that results in too many people being ill fed. And she asks “Why? Her insightful reporting on labor and economic issues involving agriculture and food, coupled with her exploration of the raw politics of food policy, explains why so many Americans don’t eat well despite living in a land of plenty. 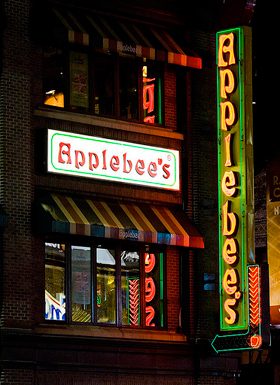 Hers is "a voice the food world needs." In his New York Times review, Dwight Garner wrote "The book Ms. McMillan’s most resembles is Barbara Ehrenreich’s best seller 'Nickel and Dimed: On (Not) Getting By in America' (2001). 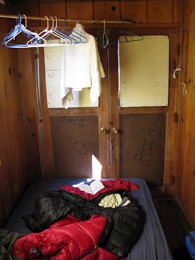 Like Ms. Ehrenreich, Ms. McMillan goes undercover amid this country’s working poor." As a working-class transplant, raised by her dad during much of her childhood in rural Michigan, Brooklyn-based writer Tracie McMillan has written about food and class for the past decade. A college graduate who worked her way through school, she understands the perils of being the one who narrates the lives of the working poor. From the inexpensive packaged food she ate growing up to the meals she tried to prepare while working at the low-wage jobs she recounts in her book, McMillan knows bad food from good and writes about what it takes to get rid of one and embrace the other. In her book, she details how she budgeted for food when she was working at these jobs, and compares that with food spending for American households of four. 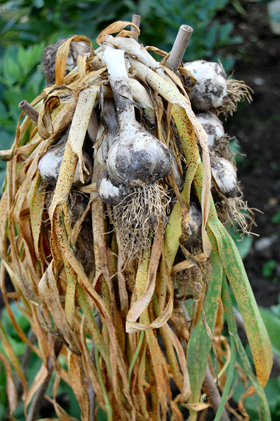 Is your neighborhood a "food desert"? 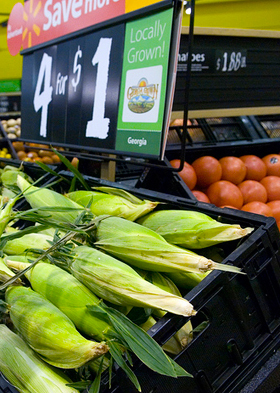 Find out at the USDA's interactive "food desert" locator. As an investigative journalist covering food issues in New York City for the magazine City Limits, McMillan mapped its “food deserts,” identifying swaths of the five boroughs where residents had no local access to a major supermarket. In Detroit, where McMillan lived while commuting to work at an ex-urban Walmart grocery store, not a single national grocer had set up shop within city limits, compelling the city’s residents to head to the suburbs for food. Rates of obesity—the American epidemic now being replicated in countries that adopt diets of processed food—typically rise “the farther people live from grocery stores,” McMillan writes. Put a supermarket in a community the size of a census tract (roughly 4,000 people) and “fruit and vegetable consumption goes up by as much as 32 percent.” Access, in all its forms—supermarkets, but also having sufficient money and time—turns out to be crucial to better eating and better health. Challenging the narrative in some policy circles that poorer people don’t want to eat nutritious food, McMillan describes in her book what happened when farmer’s markets began offering vouchers—up to $20 a week—for produce to those who used food stamps. “In just the first year, food stamp spending at the markets increased by as much as 5 to 6 times—more than matching funds would account for,” McMillan writes. In "The American Way of Eating," McMillan carries the reader into her workplace—in the field, at Walmart, and Applebee's—where her wages were low but she observed what happens behind the scenes of the food industry. “… I mention the bird to Randy [one of her supervisors] and he tells me not to worry about it.